The one on the right is typical. Clearly, there is no button to select another skin so, our mission is to locate the little blighter. This is the icon that you have to find - it can be quite small in some cases. When you hover your mouse over it, it lights up and you get a message telling you what it is supposed to mean. Once you have clicked on it, you get back to the 'normal' skin but still no button. Down the left is this long button with a less-than sign in it. You get your list from where you can choose another delightful skin. One bug that SP2 has not cured is that of jagged-edged windows. As you can see here, shallow curves produce them in abundance. This is because for the Windows windows manager, the alpha channel (transparency) is either on or off instead of continuous (well, as continuous as 256 different values are). You can see from the implicit curves within the image that they know what this technology is, it's just that it is not applied to the windows manager. If you select the text directory listing in the KDE file manager (Konqueror), you will get the size of the directory file for each directory as opposed to the size of the contents of each directory. This actually makes sense because most of the time, you are not interested in the directory other than the fact that it is a directory and that you can click on it to look at its contents. However, there are some times when you would like to know just how much space a particular directory is taking up - say, if you want to find out which user account is taking up all of your hard drive (all you want to do is save a few smallish images but somebody has taken all 25GB with something, leaving you with no room and you want to know who). 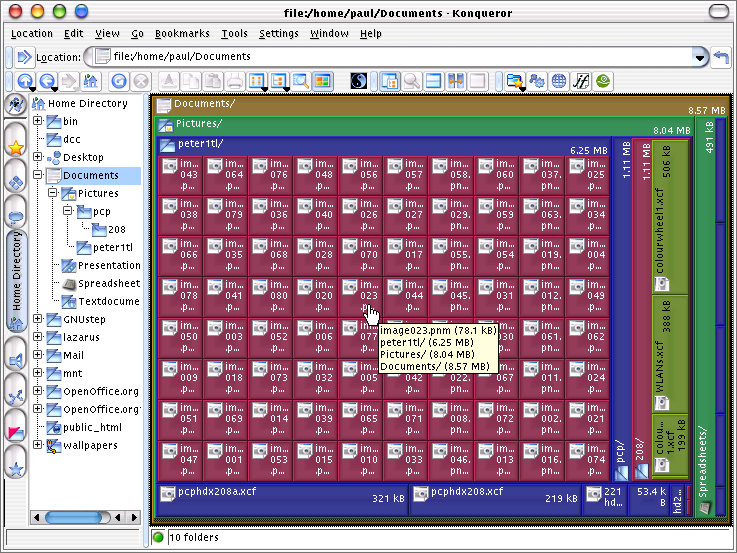 In the screenshot on the right, you can see that the pictures/pcp/208 directory has 168 bytes in it. That is because the directory you are looking at is just effectively a file that is 168 bytes long - it contains all of the important information that the system needs to locate its contents and look after it. In that 168 byte folder file are the details for three files totalling 1,093,166 bytes. Clearly, this method is not going to let us have the details we need in a very perspicuous way. 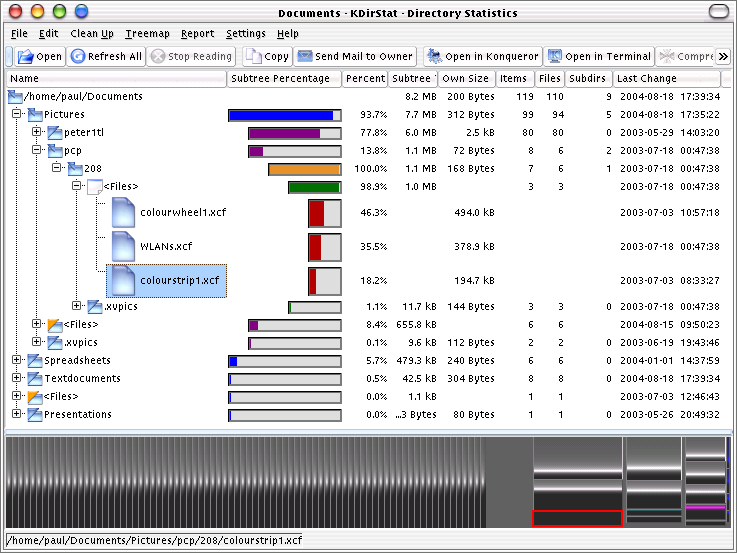 Right-clicking on the directory of interest and then selecting KDirStat from the menu brings up the program in the screenshot on the right (click on the image to open up the full screenshot in a new browser). Whilst this shows you how much disk space each directory takes at each layer, this is only within each part of the tree. If you look at the blue bars, you can see which subdirectories are the culprits. Looking at the purple layers show the next level and so on. Whilst strikingly visual, the actual usefulness of the section at the bottom is doubtful. If you click on one of the bars in the bottom section, it will open up the relevant part of the tree above it so you can locate large files quickly but that is about it. If you click on it, when you are in a subdirectory, it will break down the contents of the directory and produce a map as in the screenshot on the right (click on the image to open a full-sized version in a new browser window). Clicking on a file will open it or do with it whatever your system normally does with that type of file. Clicking on a subdirectory will open that directory and display its contents in the same way. One problem with this is that it takes a while to scan the directories recursively in order to get the image. You can see it modifying the image as it collects the data during the scan. Therefore this is only really useful if you have a fast computer or are looking more towards the twigs than the root. Just hovering the mouse over a file with give you the data that you normally get - this is part of Konqueror so whatever Konqueror would normally do in any other display mode, gets done here as well. Perl makes many jobs easy and the rest of them at least possible. To support Perl, there is a lot of material on the Internet but when you are away from your computer, you can't beat a good book. The following are six good books (three in hard copy and you will find out where the other three are as you read on). Prices - With regard to pricing, I'll quote the US Dollar prices that are on the books. The price in GB Pounds should match (within reason) the conversion for the currency but beware (I've seen different values for this). When looking around my local book stores, I found that one copy of the Perl Cookbook was on sale for £49.95. The US price was $49.95 and when I called my contact at O'Reilly, to put it politely, she conveyed the concept of dissatisfaction with the price and informed me that she would telephone them about it. A few days later, I went into that book shop (which shall remain nameless) and found that the offending price label had been removed, leaving behind only part of the label. I checked with their sales personnel and it was confirmed that the price was (now) £35.50 (including VAT). Some places will charge more, some will charge less, if you are buying it for business, you can recover the VAT, if you are a student, you will get various levels of discount and so on - I give the USD prices because they are printed on the book - the GBP prices are not. UPC: 636920001324 Learning Perl is suitable for (although by no means limited to) a beginner to the language, although it is always an advantage to have another programming language under your belt to start with. The book assumes that you are already familiar with basic programming concepts such as variables, arrays, input/output concepts and program flow control structures and, not unreasonably, how to edit text in your favourite text editor. The book is also very useful if you already know the language because Perl, like many things, is complex enough for you to be very familiar with your own area of expertise whilst at the same time being sufficiently unfamiliar with other areas (or esoteric details) to require a book on it for reference. For the uninitiated, there are differences between single quotes('), double quotes (") and backquotes (`) and wait until you get your teeth into regular expressions. The book takes you through each concept at an easy pace, making use of plenty of examples so that if (like most people) you learn by example, you will have a good grounding in the language by the time you get to the end. Each concept is gone over in detail, with plenty of footnotes and is written in good humour. There are many references to other resources on the Internet and those that are hopefully already on your computer. My only real criticism of this book is that it is in US English (not that that represents much of a problem usually as we have all become used to the US spellings in HTML, <center> for example), therefore; 'built-in', is written 'builtin' (looking like a mis-spelled 'bulletin'), and auto-increment and -decrement are written; 'autoincrement' and 'autodecrement', the former having a dominant 'toin' syllable in UK English pronunciation as a result which detracts from the flow of the text. UPC: 636920002413 Perl in a Nutshell provides (very) brief descriptions of just about everything. There are examples but they are few and far between - if you are not familiar with at least the basics of Perl (as you will have learned them from Learning Perl (above)) you will find it difficult to get very far with this book. The main sections are: Language Basics; Modules; CGI (Common Gateway Interface); Databases; XML and SOAP; Network programming; LWP (Library for Web access in Perl); Perl/Tk (GUI programming); and Win32. This book is brilliant for finding out the details of the syntax of any particular branch of Perl functionality but the lack of examples means that you will already need to know the basics of how to use any particular part of the language. This book is not for the complete beginner as they will spend a lot of time being frustrated by Perl as a result - this is more of a dip-in reference for confirming details than a read-through text. UPC: 636920003137 The Perl Cookbook provides hundreds of ready-made programs/snippets which you can copy into your own code either directly or with only minor modifications. The book covers everything from strings, numbers, date/times, arrays, hashes and pattern matching to files and directories, subroutines, classes, objects and ties to database access, interactivity, mod_perl and XML (and much in between and beyond). Each example is in the 'problem, solution, discussion' format, thus providing a useful insight into the way each 'recipe' is built. Examining these examples allows you to introduce ideas into your own programming or simply to copy a known working example to save you the time and bother of writing it yourself. If you have a spare few weeks, you can use this as a read-through which will teach you a lot about Perl and the way it is (and should be) written. Otherwise, it is a good dip-in reference that will soon prove to be worth every penny (unless you have borrowed it out of a library, of course). UPC: 636920006220 The Perl CD Bookshelf 4.0 is six books on one CD: The three books already listed above plus: Programming Perl; Learning Perl Objects, References and Modules; and, Mastering Regular Expressions. Learning Perl; Perl in a Nutshell; The Perl Cookbook; Programming Perl; and, Learning Perl Objects, References and Modules are all in HTML format whilst Mastering Regular Expressions is in PDF. if you have special visual requirements (your own easy-to-read font, size or colour scheme), you can use that here - something that no single, written version of a book can (currently) do. As always (with breaking down a long document into smaller, more manageable sections), you either end up with: many small HTML documents that require you to click constantly in order to navigate (but will, if you require a printed copy, only print out the section you actually need); or, very long pages that, if you need to come back to later on, need you to remember where you were on a page that could be the equivalent of 100 feet long on your browser. With these books, O'Reilly has chosen a position closer to the many-page scenario, allowing you to bookmark (here in a literal sense for once) where you are at any given time. In addition, the CD collection comes with a hard copy of Perl in a Nutshell which is, in my opinion, a good choice of the six - the other books are more of a read through which is really suited to software versions of the text whereas Perl in a Nutshell's dip-in nature lends itself more to having a hard copy instead of having to load up a CD each time you want merely to confirm a detail in a program. AIX; Amiga; Apple (Mac OS Classic (pre-X) and Mac OS X); Atari MiNT (FreeMiNT (Perl 5.6.0)); AtheOS; BeOS; BSDI (BSD/OS); Coherent; Cygwin; Darwin (GNU Darwin PPC); Data General DG/UX; Sequent DYNIX/ptx; FreeBSD; HP/Compaq/Digital/Tandem (Guardian, HP-UX, MPE/iX, NonStop, OpenVMS, Tru64 (formerly known as Digital UNIX formerly known as DEC OSF/1), Ultrix, Windows NT); IBM (AIX, AS/400, OS/390 (MVS)); SGI IRIX; Linux; LynxOS; Tenon MachTen; MinGW; Minix; MPE/iX; MiNT; MS-DOS; NetBSD; Novell NetWare; Sony NEWS-OS; NextStep; OpenBSD; IBM OS/2; IBM OS/400; Plan 9; PowerMAX; EPOC Release 5; QNX; Sharp Embedix; Fujitsu-Siemens ReliantUNIX; Acorn RISCOS; SCO; SGI (IRIX); Sequent (DYNIX/ptx); Sun Solaris; Stratus; UNIX; U/WIN; VMS; Stratus VOS; WinCE / Pocket PC (WinCE (also many other UNIX tools ported to WinCE available)); Windows 3.1; Win95 / Win98 / WinME / WinNT / Win2000/W2K / WinXP (Win32); and, IBM z/OS (OS/390). You have a firewall with all ports closed except for port 80 (http) port 25 (smtp) and port 110 (pop3). You already pick up your email from your ISP's pop3 server so you don't need to use ports 25 and 110. On your webserver, you have a spambot honeypot with thousands of bogus email addresses, all pointing to a domain name that doesn't accept incoming email. Someone has spidered your honeypot and the spam system is now on the verge of containing your bogus email addresses. How do you make sure that they get in there? check that the account exists on a pop3 server (as many email addresses are not delivered directly but are picked up). This will not confirm an address that is delivered directly but it could confirm one that isn't. You can pick up your very own copy of RFC 1939 - Post Office Protocol - Version 3 from http://www.faqs.org/rfcs/rfc1939.html. It will tell you everything you need to know (near enough). Note that with the exception of the STAT, LIST, and UIDL commands, the reply given by the POP3 server to any command is significant only to "+OK" and "-ERR". Any text occurring after this reply may be ignored by the client. The server starts a session in the authorisation state and all we have to recognise is 'USER name', 'PASS string' and 'QUIT'. However, we can have some fun by issuing additional information over an above the required +OK and -ERR in that we can do apparently insecure things like send additional information such as if a user is verified, but their password fails, we can say that that is what happened (it is advised that merely a +OK is sent on receipt of a USER regardless of whether the user exists and that the PASS is required before any potentially diagnostic information is sent - limiting it to something along the lines of '-ERR the USER/PASSWORD combination failed' but we can let a bit more of the cat out of the bag by telling them that the user is a valid one and that the password was wrong (possibly telling them that the user is valid after the USER command)). By returning an error in their password, we can get them to type it again., wasting some more time - those proxy servers can be a bit unreliable. There are more strategies for wasting time such as giving them long delays (only a few seconds, maybe five to fifteen - it is a busy server after all) throwing them off after only three guesses (mail clients will drop the connection if you send them an error and present the user with the error message and another opportunity to enter a password). In effect, this is like playing a game over the Internet only instead of somebody playing a machine that it pretending to be a human, it is somebody pretending to use a mail client to access a valid POP3 account on a server that is pretending to be a valid but vulnerable POP3 server. As the account does not exist (and never could) the user cannot have any valid reason for trying to get into the account. If you make it easy for them to start the next game, they will stay with it (if you have ever played Frozen Bubble [http://www.frozen-bubble.org/], you will know what I am talking about). Having lost that round, they will have some information to allow them more success (apparently) in the next round. xinetd starts programs that provide Internet services. Instead of having such servers started at system initialization time and then remain dormant until a connection request arrives, xinetd is the only daemon process started - it instead listens on all service ports for the services listed in its configuration file - when a request comes in, xinetd starts the appropriate server. By limiting the number of processes to 10 (you could make it as many as you wanted if you have enough memory - get one instance working, see just how much memory it does take up and work out how many you can afford) we are preventing a DoS attack on the system that could be achieved by opening up thousands of sessions thus taking a lot of memory. Note that each session that is started creates a record line in the nopopx file (in this case) so that if you think you are being attacked, you can see which IPs are doing it and get onto their abuse line whilst they are in the act. By binding it to a particular port, we can make it listen only on that port. The advantage of this is not that great with port 110 but if we had an smtp server that we wanted to run as a tarpit on a particular interface and also used our own smtp MTA (say sendmail) which also looks for port 25, for handling our own outgoing mail traffic, we can bind our tarpit to the external interface (using a configuration file like this but for smtp) and let sendmail grab all of the other interfaces. That way, incoming attempts to connect to port 25 will be met with a tarpit and attempts to post mail to port 25 (and therefore to sendmail) either on 127.0.0.1 (local host) or internal interfaces (such as from other machines on the LAN) will get sendmail and work as normal. Perl is like many languages in that it has different types of variables and control structures as well as in and out. It is the cross-platform nature of Perl that makes it worth learning (you can get it to work on virtually any platform) and the fact that you can do just about anything with it. The main type of variable is the scalar variable which starts with a $ as in $variable. This can hold strings or numbers of any length (up to the limits of your memory). By allowing you to do this, you can treat data in a more flexible way that does not fall victim to some of the pitfalls that C and other languages have for example, it does not use null-terminated strings. Comments are preceded with a hash mark (#). Also, Perl uses STDIN, STDOUT and STDERR so it is all redirectable which means that you can write your code, testing it on the command line, set it up as a server and test it with telnet (on that port) and then use it as a live server without having to alter the code at all. get more information about other accounts (apparently). You can modify the Perl script to add any functionality you like - supplying bogus emails full of interesting details about things that are top secret or full of other 'mailing list' email addresses - the sky is the limit. Some things that you will have to do though is waste their time, their resources and have just the right balance of failure and futility with success (whatever that is :-). In my experience, it is customary to have at least one procedure and/or variable with a German name so here, we declare the procedure schlafzeit (which is literally 'sleep time'). This is called each time something needs to be directed at the user and it reacts according to a variable with another German name $teergrube or 'tarpit'. Next, we note the time for the purposes of salting and later accounting. The @ is escaped because without doing so, it would be used to show that the string following it is in fact the name of an array. Thus, if you had "@bill", it would use (or attempt to use) an array called "@bill". If you use "\@bill" it generates the string; "@bill". which sends a string like: +OK POP3 server ready <726.1096045378@pop.domain.com> to the user at the other end, whether it is a mail client or someone with telnet. We now have the time we started all of this and the ball is in the other court, so to speak. While this is going on, we do a few background operations and then wait for the 'thing' at the other end to respond. When we get a response, we look at the time again and, as all we have to go on is the amount of time it has taken them to respond - that is all we can use. If it is a machine, it will be fairly quick as it is automatic but if it is a human, it will take longer to type. We can set a threshold value for our decision which I have nominally set as 3 seconds but you could set this lower if you found that people were logging on with clients consistently quicker (say 2 seconds) and this could differentiate better between people with a client and people pasting a piece of text into telnet. The main program loop happens for as long as the client keeps the connection open. If they enter QUIT, our server will end the session (after an appropriate delay) but if they just press their 'end session key sequence' (normally Ctrl+D or Ctrl+] (or something similar)) once the tarpit checks to see if STDIN has anything else to offer, it will bypass the loop and execute the next command. In the first line the /string/ structure tries to match the string against the input. Before the word QUIT, we have a caret (^) which means that the string that follows, if it has to match, has to be at the beginning of the input. So, /^QUIT/ will only match with QUIT, it will not match with FQUIT or Quit or anything else. Following /^QUIT/, we see an 'and' which, if the first part is true (ie matching the string) runs what follows - the contents of the 'do'. The rest is pretty self-explanatory. Finally, we break out of the loop for some reason or another (the client end said QUIT or they got thrown off the system for some reason) and we execute the procedure done(0). At the end, I have put the subroutines but you don't have to - you can put them at the beginning or intersperse them between other parts of the program, making it as legible or illegible as possible. It actually doesn't matter as long as Perl can understand it, it's just that if you make it legible, you will be able to understand it when you come back to it in a few months if you want to change something and you will have to find out how it works. I have used plenty of comments in here to make it easy for you to see what is going on as it is easy for somebody else's code to look like three platefuls of spaghetti. To see the nopop source in another window, click here. To see the source for the open source program (which is included here for completeness) that monitors the system for the existence of nopop running, click here.